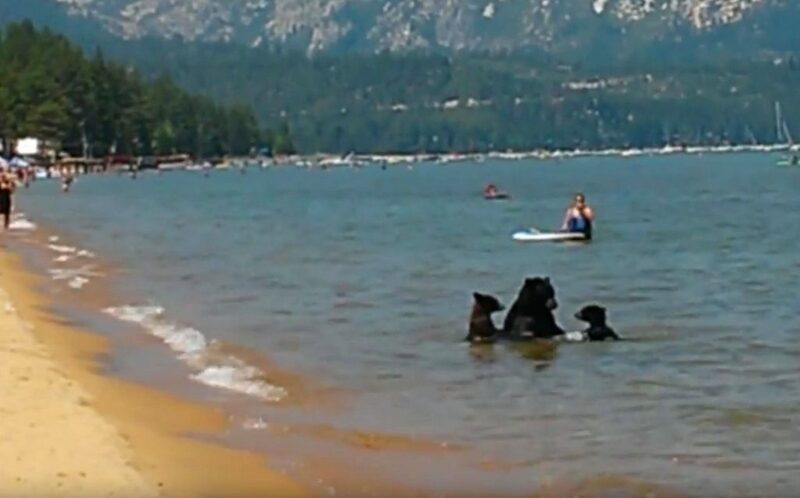 Move over Goldilocks, Lake Tahoe bears are not waiting for you and your friends to get off the beach. This momma bear and her cubs are ready for a swim and a snack. Visit Lake Tahoe this summer and you may get a peek at our favorite forest neighbors. 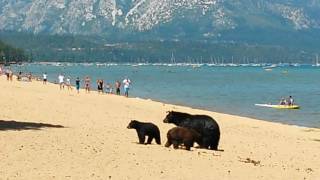 Three Tahoe black bears visited Pope Beach on Thursday to the surprise and delight of many two legged visitors. Beach-goers respectfully maintained their distance as the trio cooled off in the water then made their way to the picnic area for a treat. Lake Tahoe bears are a wonder to behold but let me caution you. Bears can be extremely dangerous to human beings if you get in a confrontation with them. People can be very dangerous to Lake Tahoe bears if you feed them. When bears become comfortable around people they are emboldened and will continue to visit populated areas placing people at risk. If a bear creates a nuisance, authorities will tag and re-locate the bear to a more remote habitat. If the bear continues to frequent areas populated with human beings, the bear could end up being euthanized. So please, do not encourage bears to co-habit with people by feeding them, this could ultimately lead to their demise. 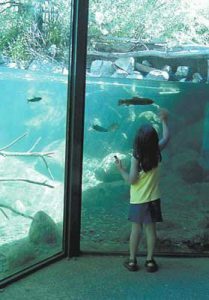 Come visit Lake Tahoe during the summer and you may get a peak at one of our forest neighbors. It is certainly an unforgettable experience. Visit http://ww2.kqed.org/news/2016/08/04/mama-bear-2-cubs-join-the-crowd-at-lake-tahoe-beach/ to learn more about momma & her two cubs at Pope Beach. 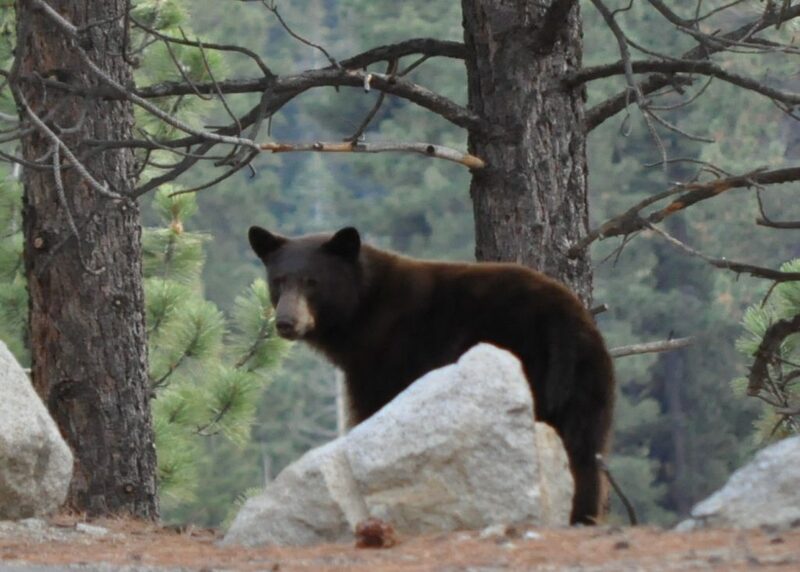 Lake Tahoe Bears – Friend or Foe? 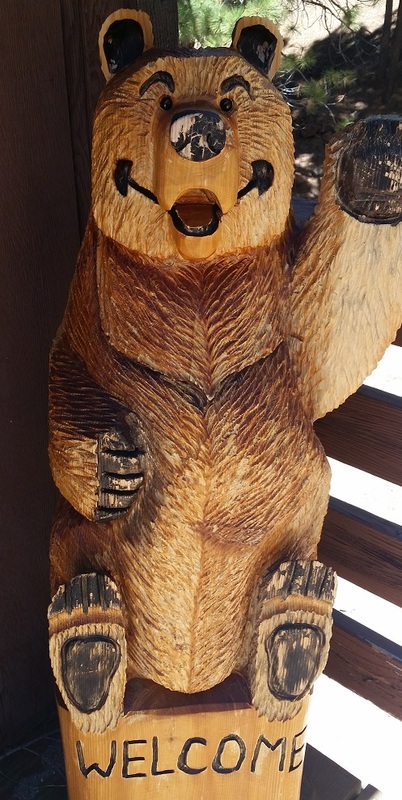 Everybody loves bears; stuffed bears, carved bears, bear jewelry, bear photos and bear stories. When you visit Lake Tahoe you encounter bears everywhere. Why? Because everyone LOVES bears. Or do they? Annie the bear welcomes all my guests. You notice I did not mention ‘live’ bears. My friends and family come to visit Lake Tahoe and buy bear necklaces, bear mugs, and bear sweatshirts, but freak out if they see any of our Lake Tahoe bears walking down the street. First they freeze in fear, then they begin walking slowly backward, before they turn and run full out for the house. This is usually followed by lots of screaming and hyperventilation. Adult bear across the street from my house. 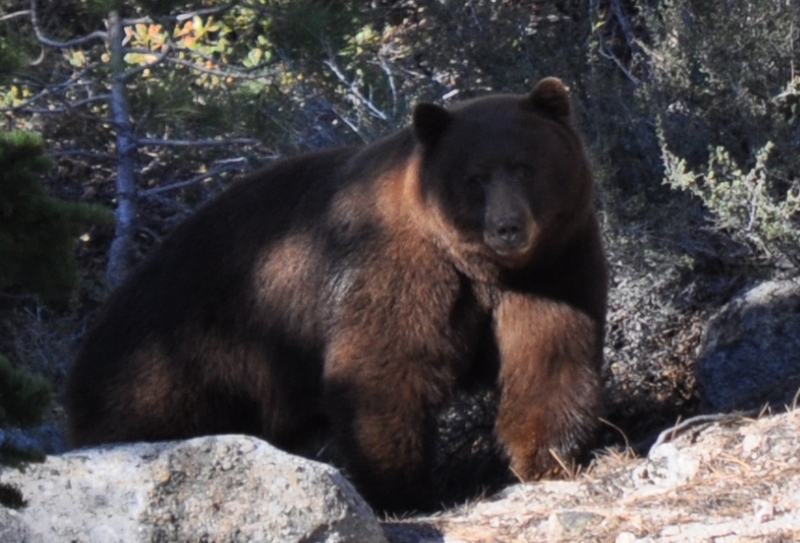 Perhaps those who visit Lake Tahoe imagine the Tahoe National Forest operating like a large zoo; the bears stay on their side of the forest and the people stay on theirs. 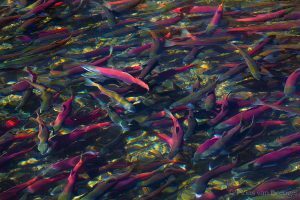 Has anyone mentioned this plan to the Lake Tahoe bears? More aptly, has anyone ask the bears if we could turn their home into a vacation destination, and pave over their food supply? I LOVE living in Lake Tahoe and yes, I love Lake Tahoe bears. The Tahoe forest is home to the Black Bear whose fur can be blond, brown or black. 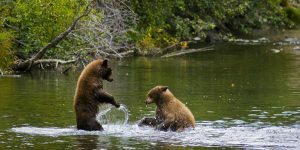 These bears are generally peace loving and their cubs are playful and energetic. Black bears spend the winter in a state of light hibernation for which they must prepare by eating loads of food during the summer. This foraging for food takes them into populated areas, where they would generally prefer not to be. I don’t know if they like us, but they appear to want to eat and live in peace with us. 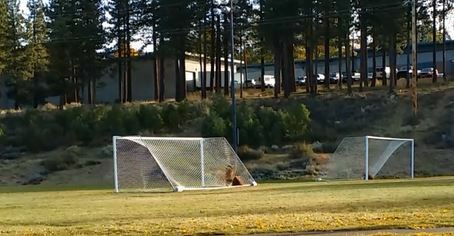 This bear cub is sitting in front of a neighbor’s house watching my children play soccer. What do you think? Do you like bears? 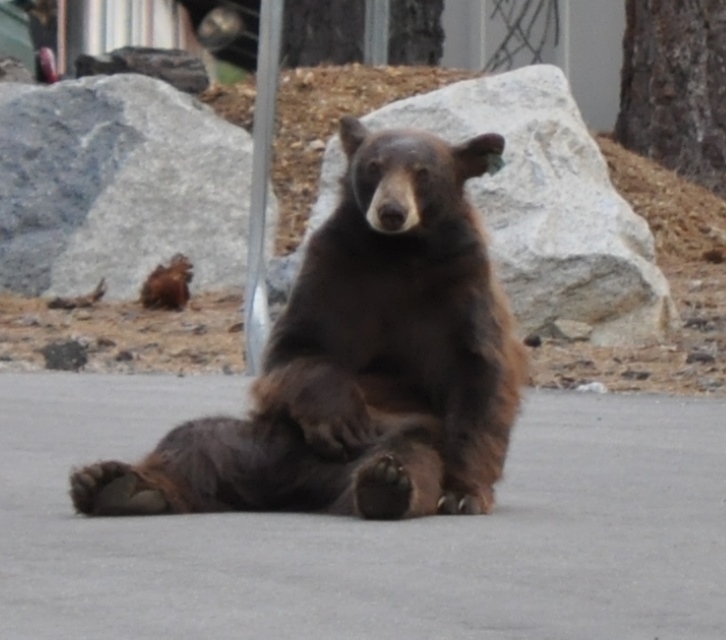 Do you hope to see one of our Lake Tahoe bears strolling down the street toward you or would you rather enjoy their beauty from afar….really far? I am interested to know what you think. Please add your comments and questions above. If you see one of our beloved Lake Tahoe Bears take the following advice from the US Forest Service. In Your Yard: Do not run. Be aggressive and assert your dominance by standing tall and making noise that will scare the bear away. Banging pots and pans together and shouting loudly works well. In the Woods: This is the bear’s territory, respect that and do not run. Make eye contact cut don’t stare, pick up small children, make yourself appear as large as possible, stay calm and quiet, back away and enjoy the experience from a safe distance. Anywhere: If the bear attempts to get away, do not block the bear’s escape route! Bears will often climb a tree if frightened and usually won’t come down if humans or dogs are present. Please add your comments and questions to the comment box above.